Everyone Deserves to Have it All! I will be honest; grocery shopping is not my favorite thing to do. But, one thing I do love doing is saving big bucks when I shop. I can put the savings towards something else, whether it’s treating myself to a new book or journal, taking the kids out for some fun or our next travel adventure. Food Basics is committed to providing products that are always at great prices, always fresh and always in-stock. That way customers can save and put those saved dollars towards something else that makes them happy. Even if we shop in store because we want to or need to, we all deserve to have it all, right? We love to see new places and travel together as a family, so saving money while shopping at Food Basics helps us put those saved dollars towards something we are passionate about–travel. Those responses were put towards as an entry into the ‘I Want it All’ contest, where participants had a chance to win 1 of 3 free groceries for a year prizes. How wicked awesome is that? To keep that magic going, the grocer decided to kick-off a year-long wish-fulfillment campaign during the holiday season. They skipped their big marketing campaign this year and are now surprising 6 lucky shoppers with their wishes. That is exactly what each winner will be feeling when they find out the truth behind the gift they already won. Each winner has been told that they’ve won a shopping spree to help with their holiday shopping. Which is true but the REAL truth is that they are in store for much more! They’ll be surprised with their wish from this summer’s contest! 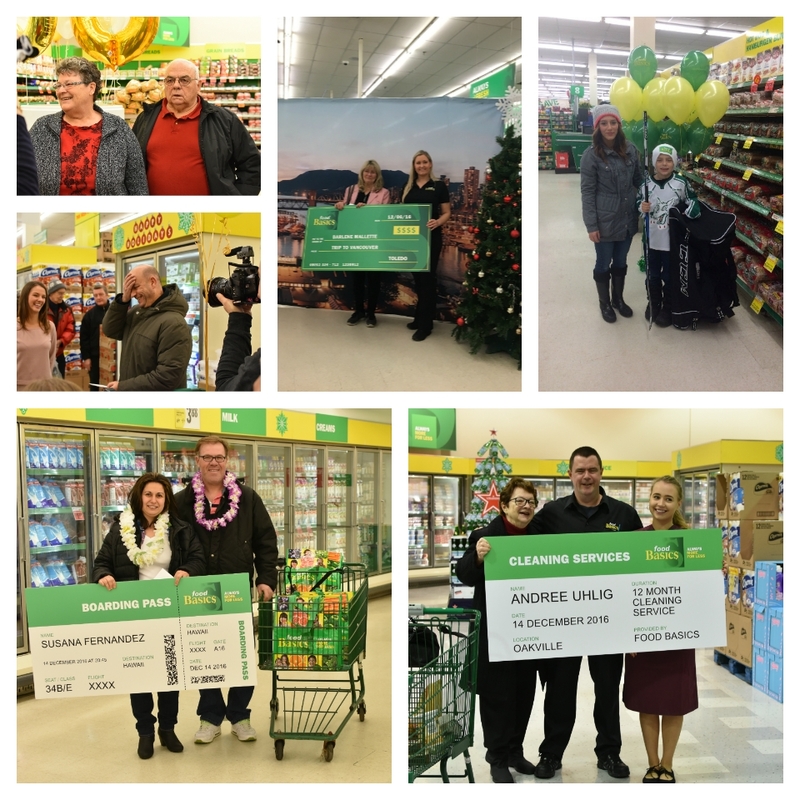 Food Basics customers can really ‘Have it All’ this holiday season! Wish: She lives in Toledo and her wish was to have the chance to visit her grandkids in BC. The Real Surprise: $1,500 travel gift card to help make her trip a reality. Wish: This couple from North Bay wanted to take a trip to celebrate their 50th anniversary. The Real Surprise: $5,000 travel card to put towards their trip. Wish: Hasn’t seen his parents in 5 years and his wish was to be able to see them again. The Real Surprise: A $4,000 travel voucher to bring his parents to visit Canada. Wish: She’d hire a cleaning lady to help with the house work. Wish: That her son could play hockey and that she could be able to save for his education. The Real Surprise: New hockey equipment, sign-up fees for a local team, tickets to a Sudbury Wolves game, a Sudbury Wolves jersey and $1,000 towards her son’s RESP. To keep the excitement going, one lucky Whispered Inspirations reader will WIN a $250 Food Basics Gift Card because you really can #HaveItAllatFoodBasics! This contest opens on December 15th, 2016 and closes on December 30th, 2016! Open to Canada only! I know we often don’t think that dollars and cents can go a long way but, if you focus on finding the best deals like Food Basics offers, you’ll discover that the savings start to add up. Start putting it towards something that makes you happy, you too, deserve to have it all. What would you do with the money you saved on groceries? I would take the gift card and the money I use to get groceries with and fill my cupboards and freezer, large family to feed thank you for the chance. I would love to be able to take my three girls away on a family vacation. As with just about every other person on this planet, money is tight, so anything we save gets hidden away. Maybe some of it can be used for a vacation! I would like to save some extra money for vacay time! I would use it to stock up on Pantry Essentials, would definitely help the budget out. I would use the extra money that I would save at Food Basics to help pay off some bills. I would treat my parents and my sisters to a nice dinner at a restaurant. Id like to get a lil pampering for myself with the money I save , maybe a massage ! I would pay extra bills or go out to dinner. With food prices on the rise I will keep the extra money for the next grocery order. With the extra money I save, I would buy some fabric to make a rag quilt. With the extra money, I would finish buying Christmas presents! I will splurge on extra groceries to treat my family to some special foods and beverages! This would help my growing family for Christmas! I would put groceries in the food donation bin with my extra savings. I would use it to go to a trip to Nova Scotia, my hubbys mothers grave is down in Truro, and he usually makes the Trip down (Were in Ottawa) every Summer but were financially not able this year. I would use the extra money to buy me some special treats like shrimp and steak. I would buy my kids some new clothing. 🙂 Thanks! With the extra money I save it would allow us to go out for dinner as a treat. We would use it to Buy extra snacks for Christmas Eve. I would use it to stock my freezer up! The money I would save would be kept for my next grocery purchase. I would pay extra bills. I am currently living on one income due to my husband being losing his job due to downsizing. He has yet to secure a full time job. I would love to fly out to spend time with my grandbabies ! They moved for work with my daughter to San Jose Ca. so far away out of the country! I would save the extra money for a rainy day as we live on a budget! I would put it towards buying diapers for our little one! I would save it up for a nice family vacation. I would probably use the extra money I save towards getting a new (used) vehicle. I would have a nice dinner out with the extra money saved from Food Basics. OOOh maybe a date with my hubby ! Put it towards more groceries especially fruits and veggies since they tend to be more expensive. Paying off other bills would be the smart way to use the extra money. As a pensioner, I would stock my pantry and small freezer. Groceries are getting expensive, def being putting towards food. Thanks for the chance. I will use the money I have saved to buy textbooks as I am taking courses at my local college. I would sock it away towards a vacation! i would put the savings straight into my vacation fund i have started! I would use the extra money to buy some new clothes. We use the savings from shopping at Food basics and set it aside for out next trip to get groceries from Food Basics. We have fees for our trailer park coming up so I could use the money towards that too. Always ways to use extra money when you are on a budget. I would buy myself a lazy boy chair that I have wanted. Wow, there would be so many things I could do ith the money saved. Pay some bills. Maybe get myself something special. I would use the $250 saved to pay for new winter tires! I would spend my savings from Food Basics on snacks. I would use the extra money to pay down some bills. I would probably use it to buy a lot of books !!!!! Probably spend on the kids for something they outgrew! I would buy our groceries instead of my husband having too. I would love to win so I could have enough food in the freezer and cupboard for my hubby when I go in for a surgery. I would use the extra money to help pay down another bill we have. I would treat my parents to a nice dinner out. If I won this awesome prize, saving money on food at Food Basics, I would pay off my MasterCard bill. My favourite feature of the KENMORE PRO PROFESSIONAL BLENDER is the 11 speeds, plus pulse option. I would take some time for myself and go to the spa! I would put the extra savings toward a few special treats to enjoy during the Holiday season! I would buy my husband a nice birthday gift in January ! Would use the extra money to pay onto other bills. I would buy groceries for food bank donations with my savings. I would help my family with grocery shopping! I would use the extra to save up for a trip. I would spend my savings and treat myself to lunch. I would put in on some of our other bills if I had the extra money. I would buy a gift for my sister who could really use some cheering up lately!!!! I would buy some groceries for my son with the savings from Food Basics. Would definitely be using it to pay down other bills, 2016 was not a nice year to our budget. I would put the money in a vacation fund! With my savings I would put it towards visiting family. Would use it to to pay down some money on another bill. I would use the extra money to save toward a summer vacation. I would use the money to pay off some extra bills. I would buy grips for my boots with my savings from Food Basics.I fell in the parking lot when it was slippery and I do not want to fall again. I do not really save any extra money per se , really I have an extremely strict budget so Food Basics is one place that allows me to get what I need within the means . I’d put the extra money towards a little family vacation!! Any extra money saved would be put onto other bills! With the money I save I would pay off my credit cards from Christmas shopping. I would go out for coffee with my savings from Food Basics. I would treat myself and mum to a spa day! I would save it and put it in our emergency funds! With the extra money I would pay off some money on a bill. Our toaster oven that we use everyday just died so I would use my savings from Food Basics to buy a new one. Would use the extra money and put it on another one of our bills. I would love to help out someone with the money i save ! I would use the extra savings for a trip to visit my parents across the country. Saving up for a vacation!!! I would get the repairs and maintenance done on my vehicle that have been recommended. I would use it to pay for the gym! I would love to fly off to the Prairies to visit my granddaughter. I would put it in a jar to save for a vacation ! I would use the extra money to pay bills. I would use the extra money to help pay for gas. I would use the savings from Food Basics to treat myself to coffee. Definitely would use the extra money on other bills, goal for 2017 is to get bills paid off! I would take french lessons!